In 303 A.D., Barbara is the beautiful, twenty-yearold daughter of Dioscoro, the Roman governor during a time of fierce Christian persecution. Barbara is a pagan, but when Giuliana, a slave raised alongside her almost like a sister, is condemned to death for her Christian faith, Barbara rebels. She valiantly attempts to save Giuliana, as well as other Christians being persecuted, boldly protesting to her father and other government leaders. When that fails, Barbara makes a daring plan for the successful escape from prison of her Christian friends. Saint Barbara is also the story of her profound love for Claudio, the noble Roman soldier whose life she saves, as well as her deep compassion for all afflicted humanity. The courageous and holy witness of her Christian friends inspires her to convert to their religion, a decision which will eventually cost Barbara her life. Before her death, Barbara discovers she has journeyed down the same path as her mother, who was taken from her as a child for having made the same choice, to become a Christian, which had never been told to Barbara as she was growing up. Barbara is the victim of many acts of cruelty in the last period of her life. The serenity with which she overcomes such barbarity can only be attributed to her new faith in Christ, which gives her the strength necessary to face the most difficult trials and to forgive her persecutors. 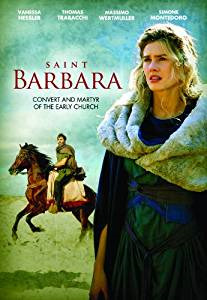 Set in the Empire Studios, reproducing ancient Rome, Saint Barbara recreates authentic atmosphere and a realistic sense of the the time period, mingling historical and some fictional characters. Starring Vanessa Hessler, Thomas Trabacchi, Massimo Wertmulle and Simone Montedoro.